Three former Montana football stars have earned a shot at making an NFL roster following a busy NFL Draft week. Defensive lineman and Helena native Caleb Kidder signed as a priority free agent with the Minnesota Vikings, cornerback JR Nelson also signed as a priority free agent with the Kansas City Chiefs, and safety Yamen Sanders earned a camp invite from the Oakland Raiders. 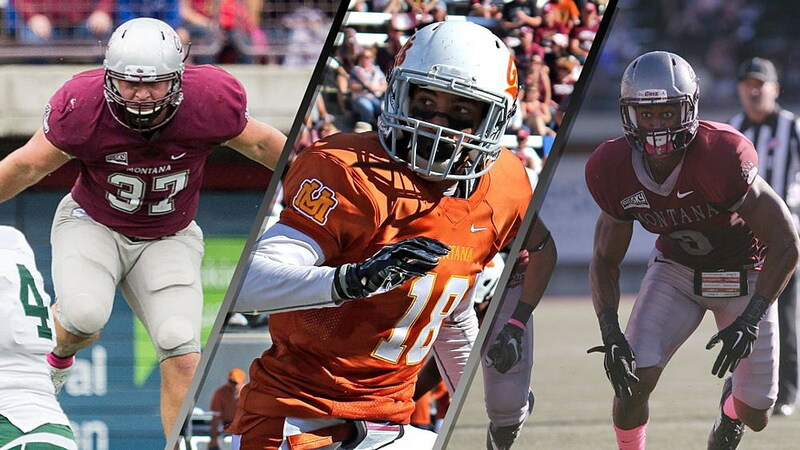 This year’s class of three Grizzlies entering the league marks the twentieth straight year a player from Montana has either signed a free agent contract or been drafted by an NFL team. 1996 was the last time a Grizzly senior class did not produce an NFL prospect on draft week, though quarterback Dave Dickenson would eventually spend time in the NFL before going on to fame in the Canadian Football League as a player and coach. After posting some of the nation’s best pro-day numbers, Kidder’s NFL dreams became a reality on Saturday, getting a contract offer from the Vikings shortly after the completion of the draft. “I’m beyond elated. I’m just so excited to have the opportunity. It’s something that I’ve been dreaming about. I can’t express my emotions more than just being so excited, it’s beyond belief,” said Kidder. When the sixth round of the draft rolled around on Saturday morning, Kidder’s phone began to ring off the hook as the two-time All-Big Sky selection entered talks with the Chicago Bears, Tampa Bay Buccaneers and Baltimore Ravens. But Minnesota was the most aggressive in their pursuit of Kidder as a free agent. “The Vikings called me probably six or seven times in a span of twenty minutes,” said Kidder, who leaves on Sunday for camp in Minneapolis. When the draft closed, Kidder weighed his options and chose to sign with Minnesota after forming a relationship with defensive line coach and former Griz football player Andre Patterson. Patterson played at Montana in 1981 and served as a Grizzly graduate assistant in 1982 after his playing career was cut short by injury. “It was such a good fit, and I just felt at home calling myself a Viking… and to be coached by an ex-Griz, I couldn’t be more excited,” said Kidder. Kidder turned heads for NFL scouts on Montana’s pro day on March 13, putting up 30 reps in the 225-pound bench press, running 4.72 40-yard dash, a 6.91-second three-cone drill and going up 33 inches in the vertical jump. If Kidder were in attendance at the NFL combine, his 30 reps in the bench press would have placed him in the top 10 among all competitors, and his three-cone time would have been the second best among all defensive linemen. Nelson leaves Friday for rookie minicamp in Kansas City after signing a three-year priority free agent deal as Montana’s leader in both pass breakups and pass deflections with eight each in 2016, despite playing in only five games as a senior. Nelson’s impressive 34.5-inch wingspan put him on the radar with other teams such as the Detroit Lions but chose to sign with Kansas City because he says he felt right at home in their system. “When it came down to it I just had a really good gut feeling about the Chiefs,” said Nelson. Nelson also posted some of the day’s top numbers at UM’s pro day in March, running the 40-yard dash in 4.47 seconds with a 10-yard split of 1.53 seconds. His 40 time of 4.47 was the fastest time among the 10 athletes who competed at pro day. His three-cone speed of seven seconds flat was the second fastest time as well. Those numbers added up to an opportunity of a lifetime for the All-Big Sky cornerback. Completing Montana’s signing day selections was safety Sanders, who accepted a minicamp invite from the Oakland Raiders after finishing 2016 tied as UM’s seventh-leading tackler with 32 takedowns. Sanders, who checked in at 6-4, 215-pounds, also posted some eye-popping numbers at pro day with a 42 inch vertical and 24 reps on the bench, which would have been the most of any safety at the NFL combine. Sanders came to Montana in 2015 from the University of Arizona and started in 20 games for the Griz and was a 2015 All-Big Sky Academic team member. Only two players from the Big Sky Conference were selected in the 2017 draft, with the Los Angeles Rams selecting both Cooper Kupp and defensive end Samson Ebukam from Eastern Washington in the third and fourth rounds, respectively.